How can I make smooth motions in MMD? 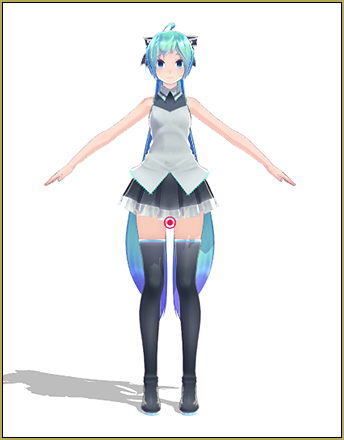 Why do my MikuMikuDance motions look stiff? How can I make natural looking motions in MMD? Hello everyone! 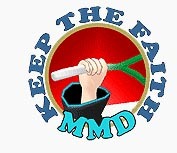 I’m UndeadLuciel, a new author of the LearnMMD community! This tutorial is about how spacing motions across several keyframes would make your animation more natural. 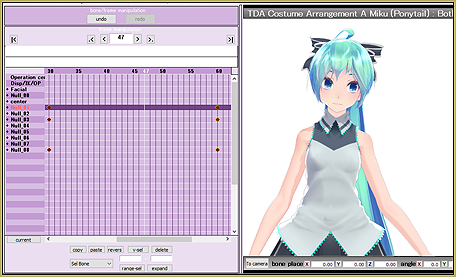 For this tutorial, I’m going to use Xoriu’s TDA Costume Arrangement A Miku which you can download right here. I’ll demonstrate to you how most MMD beginners set up keyframes and why it looks stiff. Then I’ll show you an easy way to immediately make a motion smoother and more natural simply by moving a few key frames around! I started off by making a simple swaying motion, where Miku will tilt to the side every 30 frames, or 1 second, like this. I used the upper body, upper body2, neck, head, arms, elbows, and wrist bones. After this step, many beginner MMDers would add an interpolation curve and be done with it. If you don’t know how an interpolation curve works, how to use it, this article by TaiGao should help! I used the Basic smooth motion curve shown in the article. After you add the interpolation curve and play the video… Not the most choppy thing in the world, but not exactly smooth, either. This is how I see most beginner MMDers animate, where all the movements are adjusted and registered on the same frame. You might think that an interpolation curve would automatically make any and all motions smooth, that’s simply not true! The interpolation curve only determines how MMD fills in the frames between the keyframes you registered. If you want your motion to look more natural, you need to make sure each bone moves at a different time then the others. I want you to pose in front of a mirror and sway a bit to the sides, look at your own movements and study them carefully, you’ll see that everything starts and stops moving at a different time. Adjusting and registering all your movements on the same frame would be the equivalent of having everything starting and stopping at the same time, which isn’t how normal humans move! Then you’ll see immediately that the motion looks much more natural! There’s a lot of ways to move the bones around and experiment to make it look more natural. For example, here I made the Arm bones go 5 frames before or after Upper body bones move. Move all the bones that you can see, even if it’s just by a few millimeters! Humans are always moving, even if they look completely still, there are still some very slight movements. This is because when a real person moves, their entire body moves, not just their elbow or head. Go ahead, try turning your head side to side, you’ll see that your upper body will also turn a bit with your head! Don’t be afraid to exaggerate movements! Make limb movements wider, tilt the model back a bit more, it’ll make your animation look much more interesting. Don’t move a bone in only one direction, tilt the head bone left, make it look sideways, tilt it down a bit… More dynamic movements make your motion look more human and less robotic! See how nice this motion has become… scroll up to compare to that first example… so nice, now!